Whether you’re completely new to the world of weed or have been a longtime fan of the flower, vaporizers top the list when it comes to the ease and accessibility of marijuana products. From weed pens that give you measured doses to simple and sleek vapes that make it a breeze to get your high on, there’s so much to choose from—especially when it comes to shopping our stock of vaporizers at our MedMen store off the Las Vegas Strip. So, without further ado, we’re here to give you our list of the top marijuana vapes in Las Vegas, all of which just so happen to be found at the one and only MedMen at Paradise and Harmon. [statemade] is behind countless vaporizers that we simply can’t get enough of. Each pen has a state-of the-art battery designed to last the life of the pen—and they look pretty great, too! First up on our list is the sativa dominant [statemade] joy pen. It’s our favorite vape to get our spirits high and feel at peace throughout the day or night. It brings out a bit of sweetness that perfectly lifts up any dull mood. What’s not to love? For those looking to get a bit more of relaxation, the ebb pen is for you. The [statemade] ebb pen comes in the indica dominant variety and is meant to bring you smoothly out of a rushed and hectic headspace and right into a chill existence. We’re also big fans of the [statemade] max pens. Full of a great sativa boost, the max pen works in the same manner as its name suggests: it gets you to that peak level of energy so you’re ready for activity of any kind (except for driving, of course). Looking for a bit more of the chill vibe? The hybrid zen pen will have you saying om in no time and ready for a whole lot of enlightenment. And then there is the zzz pen from [statemade]. It gets straight to the point with its playful name, and with indica at its root, the zzz pen is an optimal product to get yourself into the sleeping zone. Moving out of [statemade] land, we now venture to the Dream Catcher pen from Deep Roots. While its moniker may have you thinking that it’s your ticket to dreamland, it’s a sativa strain that will have you blissed out and feeling like a dream. Deep Roots doesn’t stop there. They’ve also got Summer Splash and Island Paradise, both of which are made of the sativa strain. Rounding out their pen collection is the indica-centric Harvest Tart. Pick a strain, flavor, and fun name—Deep Roots has got you covered! Looking for more sativa favorites? Thinc Pure’s Energy pen and Blue Dream by RSO GO make the list of our ideal vape pens, while RSO GO’s Frosted Strawberries, as well as AO’s Yellow Pen and Red Pen bring hybrid to a whole new level. 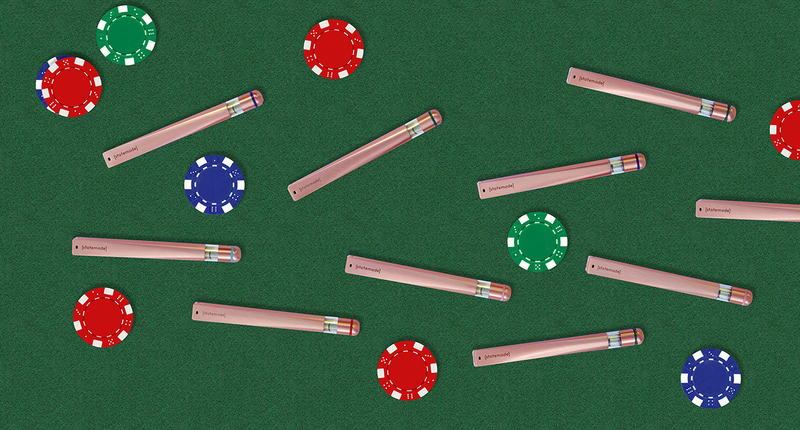 And there you have it—the top marijuana vaporizer products in Las Vegas. Stop by our MedMen store, which is placed perfectly on the avenue of lights and action, to pick up the vaporizer (or two or three) of your choosing.